Katey is an MBA student who has worked in the Aerospace industry for close to a decade. When she isn't coding the day away or star gazing from her telescope, she enjoys taking care of her farm animals and kitting up something new! I am a fairly new chicken keeper. As of now I have fourteen hens, two baby roosters (cockerals), and four baby hens (pullets). Though I don't live in a typical community (200 acre farm) and my hens spend most of the day free ranging, I feel like I've had enough experience to give some pointers on raising them and maybe you can decide for yourself if you should own them. Believe it or not, chickens need a lot of attention. My typical day consists of waking up at 6 AM to feed and water them. While I'm out there I also give them some scratch and open up the coop to the run. Around 11 AM I go out and open up the pen so they can run out and exercise. I usually will give them some treats at this point and spend a little time talking to them and (when I have a rooster) playing chase. During this time I am also collecting eggs from the coop. At night, my girls will all make their way to the coop and I go out and collect their food and lock them up for the night. Keep in mind that this is a typical day for adult hens, if you have babies then you will be tending to them all day. Chickens are pray animals so life ends up being you and them against practically every animal out there. In order to keep them safe you will need to build a solid structure for them to live in. 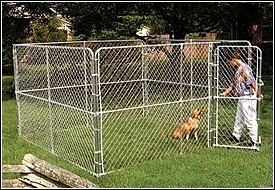 I use two 10x10x6 dog kennels for my hens. Both are fortified with hardware cloth (yes, it's expensive but nothing gets through it) and covered with tarps to block out the elements. I also do a hardware cloth skirt around ten inches out of the coop so nothing can tunnel in. This is just for night time! If you plan to free range them then be prepared to be scaring off the hawks (never shoot a hawk or prey bird) with the shotgun (if you're in the country like me), or making sure that the neighbors dog doesn't get them if you're in the city. Lets face it, there's nothing better than farm fresh eggs. I love not having to buy eggs and being able to supply friends and family with eggs. I also sell a few cartons a month to help pay for feed costs (the girls practically pay for themselves). However, you have to be aware that egg production drops off in the winter and during molts (when the birds grow new feathers) and when the chickens are stressed. When I lost my last rooster, a few months ago, one of my hens stopped laying and still hasn't started back up. Though it's common for a chicken to live for 8-10 years you could have your girls for as many as 20 years. Your hen may only lay for daily (or close to it) for 5-7 years but will occasionally lay an egg until she passes.